Earlier this week, we hosted the Spectrum X Mean Girls launch party in London, where the dress code was, of course, pink. I snapped up a fuchsia suit for the occasion and it just has to get the honour of my Friday favourite for this week. 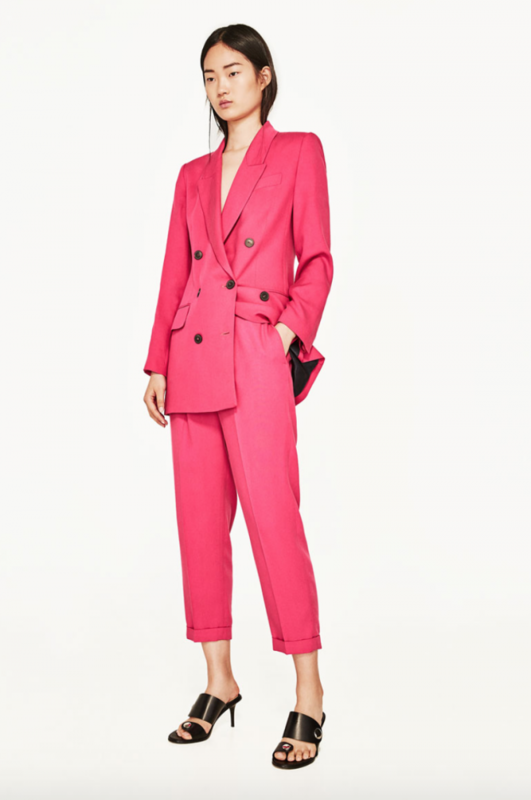 I’ve actually wanted a pink suit for a very long time but couldn’t justify the prices for something that, realistically, I wouldn’t get too much wear out of (I’m very much a black, white and grey kind of person). However, when I walked in to Zara looking for something for the event and spotted this beauty in the sale, I was sold. It was reduced from £100+ to around £30 and looked the absolute dream, so to the till I went. There are limited sizes of the trousers left online (here), but the jacket seems to have sold out so my suggestion is hot-footing it to your nearest store to see if you can pick one up. My jacket is actually a bit too big but was the last one in the shop, so I plan on just getting it tailored to fit as there’s no way I’m sending it back! I look forward to wearing the full suit (as opposed to just the trousers, like I did to the event) with a slogan tee and flats, or a cami and courts. I may just be a convert to colour! This week I’m loving my frilly trousers from Missy Empire. I’ve been after a pair for a while after seeing them on various bloggers. After much internal debate over colour options, I decided to go for grey as everything else that I own is black, but I thought that grey would still be subtle enough to let the frills do the talking. The trousers are surprisingly easy to wear, and while I’m looking forward to dressing them up with heels and a silky cami, I’ve also worn them with trainers and a plain tee for a more casual take on the style. So this week’s Friday fave is yesterday’s foodie feast, Five Guys. After a very busy day and evening working at the Spectrum x Mean Girls launch party in London on Wednesday, Jazmin and I felt like we deserved a treat after returning back to the office on Thursday morning. And that treat took the form of a Five Guys via Deliveroo for lunch. 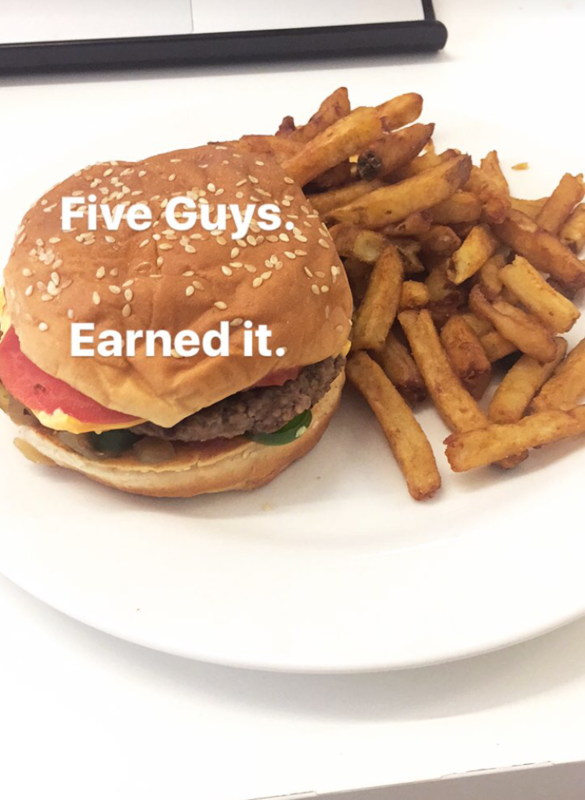 I think we’re both in agreement that Five Guys might just be the best burger around and we built our custom burgers to perfection. Cheese, tomato, pickles, ketchup, mustard, grilled onions and cheese again – my winning formula, incase you were wondering. I think we must have gone totally silent whilst tucking in, a testament to how good it is. The perfect reward after a successful event!